This coming Saturday at 7:30pm ET, the #13 Notre Dame Fighting Irish (5-1) will square off against the #11 USC Trojans (6-1) in front of roughly 78,000 at the Mecca of college football that is Notre Dame Stadium in South Bend, Indiana in what is set to be one of college football’s biggest showdowns of the year. Winning 3 of the past 5 meetings dating back to 2012, the Irish enter Saturday’s contest as a 4 point favorite (Vegas Insider) and have a 46-37-5 all time advantage over their bitter arch rivals. The stakes are high as a loss for either team will likely extinguish any glimmer of hope for a playoff berth while a win could catapult the victor into true contention. With such meaningful implications, we might be in for similar dramatics as the 2005 matchup in which the top ranked Trojans and Coach Pete, “the energetic poodle,” Carroll defeated the #9 Irish 34-31 following the infamous “Bush Push” on the goal line in the closing seconds. Prior to “the Push,” quarterback Matt Leinart had fumbled the ball out of bounds as time expired causing Irish fans to storm the field only to be returned to their seats for one more play. With 7 seconds to go, Leinart performed a quarterback sneak in which he was pushed forward into the endzone by running back Reggie Bush. The legality of the push was in question, but to this day, that controversial play has left a bad taste in Notre Dame fans’ mouths around the country and has heated the rivalry even further. Notre Dame’s Schedule Favorable for CFP Push: The Irish have been a surprise thus far after finishing last season 4-8, their worst record since Charlie Weis’ 2007 campaign ended at 3-9. The Trojans will easily be Notre Dame’s toughest test so far as their pummeling 38-18 victory in East Lansing over #18 Michigan State has been their only impressive win this season. Notre Dame’s single loss has looked better and better as they were defeated by a mere 1 point to the #3 Georgia Bulldogs who have looked like at elite force this season. A win for the Irish Saturday could very well make them a CFP contender as their remaining schedule is one of the most difficult in the nation, featuring #16 NC State at home and #8 Miami (FL) and #22 Stanford on the road. On a side note, Notre Dame’s 12 game schedule has featured 6 top 25 teams which should mute those who contend the school’s reluctance to join a conference yields them an easier schedule. USC Must Win Convincingly: USC entered this season with high expectations being ranked #4 but have since dropped to #11. Despite boasting a 6-1 record, the Trojans have looked shaky following their notable 42-24 triumph over #22 Stanford back in week 2. They narrowly escaped an unranked Texas team in overtime at the Coliseum and were able to dodge a loss to Utah in a come from behind 28-27 victory last week. USC’s only loss this year came on the road at the hands of #15 Washington State, a game in which quarterback Sam Darnold failed to throw for more than 170 yards and had a dismal 37.6 QBR. A second loss Saturday would likely remove the Trojans from CFP contention as the Irish are their toughest opponent to date and their remaining 4 games are all against unranked teams. However, a convincing victory in South Bend coupled with a strong finish to the season could put them right back into the mix. A Battle of Different Offenses: Saturday’s contest will feature two high powered offenses that have both seen much success this season. Notre Dame has one of the nation’s premier rushing attacks, averaging 308 yards per game which ranks #5 behind the likes of Army, Navy, and Georgia Tech, programs that almost exclusively run the ball. The Irish have a lot of depth at running back with 3 proven rushers in Josh Adams, Deon McIntosh, and Dexter Williams. Adams is the top back ranking 10th in the nation in total rushing yards from scrimmage, but McIntosh and Williams have collectively accounted for 9 touchdowns and 444 rushing yards in addition to Adams’ 776. Further bolstering a talented backfield, quarterback Brandon Wimbush is probable to return from a foot injury that sidelined him for Notre Dame’s last game against North Carolina. Wimbush is always a threat on the ground as he has 402 rushing yards and 8 rushing touchdowns through just 5 games. The Irish run game will look to exploit a mediocre USC run defense that will be disadvantaged with both DE Porter Gustin and DT Marlon Tulpulotu officially listed as out for Saturday. The biggest test for Notre Dame will be their ability to slow down an elite Trojan passing attack led by star quarterback Sam Darnold. Darnold was the focal point of preseason hype as he was considered the premier player in an already stacked quarterback class. Despite showing flashes of an NFL-ready passer, he has been inaccurate at times and has made some poor decisions as evidenced by 9 interceptions through 7 games. However, Darnold has 15 touchdowns and 2,063 yards through the air which ranks him 11th amongst quarterbacks nationwide. Standout receiver Deontay Burnett is Darnold’s most dangerous weapon with 49 receptions, 6 touchdowns, and 626 yards which ranks 9th in the country. In addition to Burnett, the Trojans have talented receivers in Tyler Vauhgns, Steven Mitchell, and TE Tyler Petite who are each averaging over 10 yards per catch and have at least 15 receptions and 1 touchdown on the season. USC will look to spread the ball and attack an average Irish secondary which ranks 78th in passing yards allowed per game. An Overall Even Matchup: While Notre Dame and USC’s offenses feature different powerful components, they are both averaging roughly 470 all-purpose yards per game and each have exactly 31 touchdowns which shows that neither team is one-dimensional. 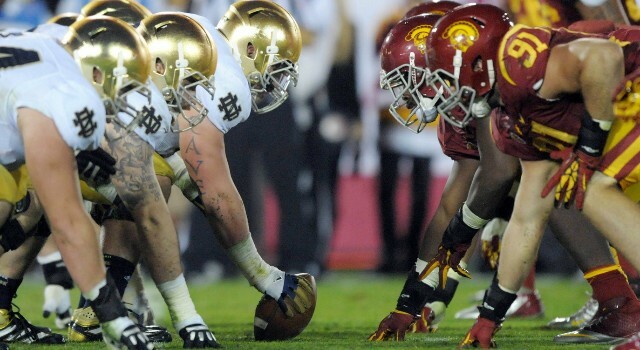 Additionally, the Irish and Trojans are scoring a total of 40 and 34.4 points per game, respectively, on average. As far as defense goes, each team is giving up about 375 yards per game, although the Irish have the advantage in terms of points allowed per game with 16.8 versus the Trojans’ 23.7. On top of the injuries mentioned above, G Viane Talamaivao will be out for USC while RB Dexter Williams is listed as questionable for the Irish after missing the last 2 games with an ankle injury. Prediction: Irish Prevail 34-31 in High Scoring Affair: USC will be playing its 8th straight game without a bye Saturday and is pretty banged up with 9 players listed as officially out and another 9 as questionable. With 2 starters unable to play for the Trojan D-Line, Notre Dame will continue to ground and pound the ball with their robust running game and a stellar performance from RB Josh Adams. Dual-threat QB Brandon Wimbush will provide additional support on the ground and will look for help from the talented receiver Equanimeous St. Brown through the air to continually attack the USC defense. Notre Dame’s defense, alongside an electric atmosphere from the Irish faithful, will be serviceable enough to prevent Sam Darnold and Deontay Burnett from dominating. Overall, a fatigued USC and rejuvenated Irish team coming off a bye will enable Notre Dame to win 34-31 in dramatic fashion. The opposite score of the legendary 2005 battle will be symbolic revenge for the Irish in this long heated rivalry.